L.A. is the latest city to ban "vaping" in some public places. camera (Getty Images) Sales of e-cigarettes are expected to reach $1 billion this year. 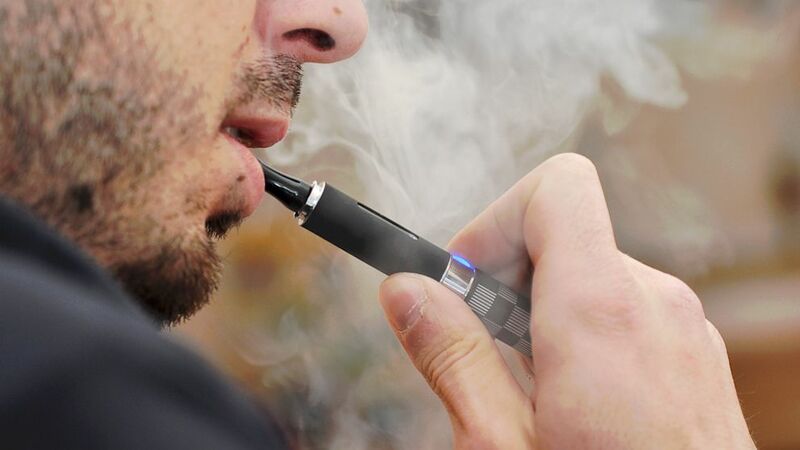 intro: Los Angeles is the latest city to outlaw e-cigarette smoking in some public places. The L.A. City Council voted 14-0 in favor of the "vaping" ban, following in the footsteps of New York City and Chicago. The electronic cigarette was invented in the 1960s, but it didn't really take off until a decade ago. The Tobacco Vapor Electronic Cigarette Association now estimates that roughly 4 million Americans use the battery-powered cigs. Here’s a look at the e-smoke trend: the good, the bad and the unknown. quicklist: 1 category: E-Cigarettes Explained title: What are e-cigarettes? url: text: E-cigarettes are battery operated nicotine inhalers that consist of a rechargeable lithium battery, a cartridge called a cartomizer and an LED that lights up at the end when you puff on the e-cigarette to simulate the burn of a tobacco cigarette. The cartomizer is filled with an e-liquid that typically contains the chemical propylene glycol along with nicotine, flavoring and other additives. The device works much like a miniature version of the smoke machines that operate behind rock bands. When you "vape" -- that's the term for puffing on an e-cig -- a heating element boils the e-liquid until it produces a vapor. A device creates the same amount of vapor no matter how hard you puff until the battery or e-liquid runs down. quicklist: 2 category: E-Cigarettes Explained title: How much do they cost? url: text: Starter kits usually run between $30 and $100. The estimated cost of replacement cartridges is about $600, compared with the more than $1,000 a year it costs to feed a pack-a-day tobacco cigarette habit, according to the Tobacco Vapor Electronic Cigarette Association. Discount coupons and promotional codes are available online. quicklist: 3 category: E-Cigarettes Explained title: Are e-cigarettes regulated? url: text: The decision in a 2011 federal court case gives the Food and Drug Administration the authority to regulate e-smokes under existing tobacco laws rather than as a medication or medical device, presumably because they deliver nicotine, which is derived from tobacco. The agency has hinted it will begin to regulate e-smokes as soon as this year but so far, the only action the agency has taken is issuing a letter in 2010 to electronic cigarette distributors warning them to cease making various unsubstantiated marketing claims. For now, the devices remain uncontrolled by any governmental agency, a fact that worries experts like Erika Seward, the assistant vice president of national advocacy for the American Lung Association. "With e-cigarettes, we see a new product within the same industry -- tobacco -- using the same old tactics to glamorize their products," she said. "They use candy and fruit flavors to hook kids, they make implied health claims to encourage smokers to switch to their product instead of quitting all together, and they sponsor research to use that as a front for their claims." Thomas Kiklas, co-owner of e-cigarette maker inLife and co-founder of the Tobacco Vapor Electronic Cigarette Association, countered that the device performs the same essential function as a tobacco cigarette but with far fewer toxins. He said he would welcome any independent study of the products to prove how safe they are compared to traditional smokes. The number of e-smokers is expected to quadruple in the next few years as smokers move away from the centuries old tobacco cigarette so there is certainly no lack of subjects," he said. quicklist: 4 category: E-Cigarettes Explained title: What are the health risks of vaping? url: text: The jury is out. The phenomenon of vaping is so new that science has barely had a chance to catch up on questions of safety, but some initial small studies have begun to highlight the pros and cons. The most widely publicized study into the safety of e-cigarettes was done when researchers analyzed two leading brands and concluded the devices did contain trace elements of hazardous compounds, including a chemical which is the main ingredient found in antifreeze. But Kiklas, whose brand of e-cigarettes were not included in the study, pointed out that the FDA report found nine contaminates versus the 11,000 contained in a tobacco cigarette and noted that the level of toxicity was shown to be far lower than those of tobacco cigarettes. However, Seward said because e-cigarettes remain unregulated, it's impossible to draw conclusions about all the brands based on an analysis of two. "To say they are all safe because a few have been shown to contain fewer toxins is troubling," she said. "We also don't know how harmful trace levels can be." Thomas Glynn, the director of science and trends at the American Cancer Society, said there were always risks when one inhaled anything other than fresh, clean air, but he said there was a great likelihood that e-cigarettes would prove considerably less harmful than traditional smokes, at least in the short term. "As for long-term effects, we don't know what happens when you breathe the vapor into the lungs regularly," Glynn said. "No one knows the answer to that." quicklist: 5 category: E-Cigarettes Explained title: Do e-cigarettes help tobacco smokers quit? url: text: Because they preserve the hand-to-mouth ritual of smoking, Kiklas said e-cigarettes might help transform a smoker's harmful tobacco habits to a potentially less harmful e-smoking habit. As of yet, though, little evidence exists to support this theory. In a first of its kind study published last week in the medical journal Lancet, researchers compared e-cigarettes to nicotine patches and other smoking cessation methods and found them statistically comparable in helping smokers quit over a six-month period. For this reason, Glynn said he viewed the devices as promising though probably no magic bullet. For now, FDA regulations forbid e-cigarette marketers from touting their devices as a way to kick the habit. Seward said many of her worries center on e-cigarettes being a gateway to smoking, given that many popular brands come in flavors and colors that seem designed to appeal to a younger generation of smokers. "We're concerned about the potential for kids to start a lifetime of nicotine use by starting with e-cigarettes," she said. Though the National Association of Attorneys General today called on the FDA to immediately regulate the sale and advertising of electronic cigarettes, there were no federal age restrictions to prevent kids from obtaining e-cigarettes. Most e-cigarette companies voluntarily do not sell to minors yet vaping among young people is on the rise. A Centers for Disease Control and Prevention study found nearly 1.8 million young people had tried e-cigarettes and the number of U.S. middle and high school students e-smokers doubled between 2011 and 2012. A version of this story previously ran on ABCNews.com.